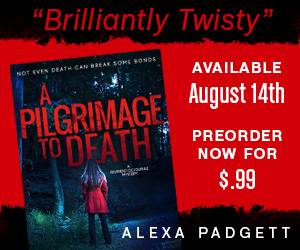 Today we have the teaser blitz for Alexa Padgett’s A PILGRIMAGE TO DEATH! We’re super excited to share this upcoming thriller with you! Check it out and be sure to pre-order today! This entry was posted in Contemporary, Fiction, Genre, Giveaway, Pre-Release, Suspense, Teaser and tagged A Pilgrimage To Death, Alexa Padgett, Contemporary, Giveaway, Mystery and Suspense, Pre Order, Supernatural, Teaser Reveal by cafemamanc7. Bookmark the permalink.